I recently read a story about a woman who owed nearly $150,000, mostly to credit card companies, and paid it all off in six years. I hope you don’t owe that much but if you do owe $15,000, $20,000 or more, there are ways you could pay off your creditors to achieve a better, less stressful life. One of the simplest ways to get rid of your debts is by borrowing enough money to pay them off. You will have to get either a secured or unsecured loan. Secured loans are those where you use something as collateral to “secure” it. In most cases, the asset will be your house – if you have enough equity. In other words, if you want to pay off $15,000 in credit card debt, you will need to have at least $15,000 in equity, which is the difference between what your home is worth and what you owe on your mortgage. Of course, if you’re currently “underwater,” you have no equity and would not be able to get a secured loan unless you owned another asset worth more than what you would need to borrow. If you don’t have an asset you could pledge as collateral to get a secured loan or if you owe less than $10,000, you might be able to get an unsecured loan. These typically have higher interest rates than secured loans as the lender is taking more of a risk because if you were to default on the loan, there is noting much it could do except turn your account over to a debt collector. The biggest pros or advantages of a debt consolidation loan are it would get all those creditors of your back and would leave you with just one payment a month. This payment should be less than the total of the monthly payments you’re making now. In fact, it should be far less. The reasons for this are that you should have a much lower interest rate and more time to pay off what you owe. If, for example, you have credit cards with interest rates of 18% or above, you should be able to swap them for a loan with an interest rate of 8% or less. It’s also easier to have just one payment a month vs. the multiple payments you’re making now. And should you find yourself in financial trouble again in the future, you’d have only one creditor to deal with instead of the many you now have. 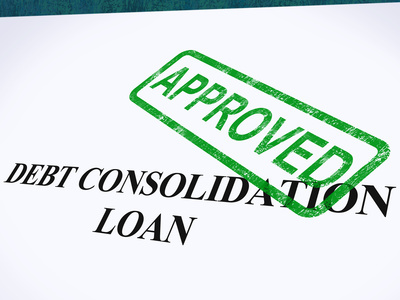 There are cons or downsides to a consolidation loan. First and foremost, you may not be able to get one. This can be especially true if you have nothing you could use as collateral such as equity in your home. And unsecured loans can be hard to come by when you’re already deep in debt. Plus, if you can get one, it may have a frighteningly high interest rate. For that matter, consolidating debt doesn’t really solve your problem. The only way your can really benefit from debt consolidation is by combining it with better budgeting, and improved money management. A debt consolidation requires a long-term commitment as it will take your five, seven or maybe even 10 years to pay it off. And you will end up paying more total interest even though you would have a lower interest rate due to the length of the loan. Another and perhaps better way to get rid of unsecured debts is by letting our debt counselors settle them. They have years of experience dealing with credit card companies and personal loan providers and can probably save you thousands of dollars through debt settlement. In most cases, we help our clients become debt free in 24 to 48 months, depending on their financial circumstances. Contact us today to learn about debt settlement and how it could help you become debt free.